After I had my chance encounter with the Electric Flower Car shows last week, I was particularly curious to see the exhibition of Taiwanese photographer Shen Chao-Liang on the same subject, which is currently on at Pier 2 Art Centre in Kaohsiung. The exhibition, as it turned out, was an eye-opener to this photographer’s fantastic work. Shen Chao-Liang has the eye for large scale vivid work that focuses on place and inanimate objects and begs you to look longer and more deeply at the image; taking stock of the different elements of the scene and piecing together their meaning and context into a story. At the same time, he also has the eye to catch the fleeting moments of life in black and white frames packed full of information. This reminds me of Joel Meyerowitz, although his work may not be stylistically the same. Meyerowitz as well as being one of America’s most revered street photographers (a quick photographic art which depends on perfect timing) is also a master of telling stories through single massive frames of large format work (large format is a decidedly slow art requiring patience and great composition). Shen Chao-Liang, born Tainan, Taiwan 1968, worked as a photojournalist and is currently lecturing at NTUST University in Tamkang. He has been photographing these scenes of Electric Flower Cars around Taiwan since 2006, using a large format camera and colour film for awesome detail and saturated images that really pop. 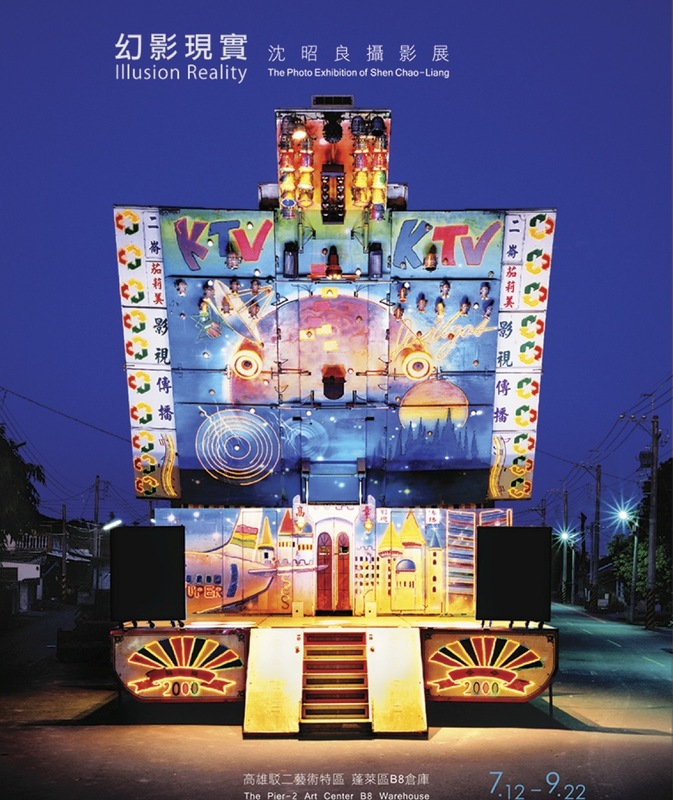 The huge printed images in his “Illusion Reality” exhibition all have a wonderful sense of the surreal. The brightly-lit stages, which seem to have crash-landed in from another world, are intriguingly contrasted with the unexpected places they appear in. Shen is concerned with the Electric Flower Cars’ role as Taiwan’s Vaudeville and sees it as a mirror of Taiwan’s vibrant culture. His work is bold, striking and intimate also. Anyone who is in Kaohsiung before the exhibition ends on 9/22, do yourself a favour and go to the see the exhibition. It is wonderful. ← Temple Dancing Girls – it’s What the Gods Wanted.